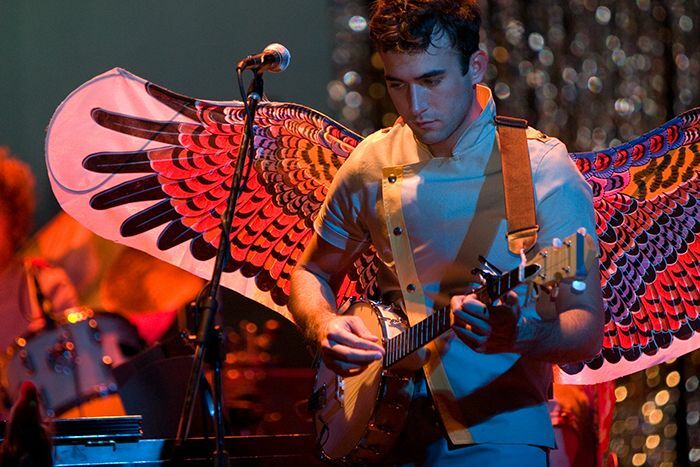 More than a decade since indie folk’s poster boy Sufjan Stevens stepped into the spotlight, Getintothis’ David Hall reflects on the how one man’s quiet voice resonated so loudly. A tenth anniversary special edition of Sufjan Stevens’ masterpiece Illinois has been announced for release in April; if any were ever needed, a perfect excuse to spend more time with one of this century’s outstanding records. Illinois was, and continues to be, emblematic in all aspects of its aesthetic, from composition and recording upwards, of the DIY ethic that manifests itself in every era of music. The album converged with the peak of the so-called music ‘blogosphere’, a phenomenon which has now largely dissipated and moved onto other areas of interest. But a large part of this relatively short-lived community was composed of voices whispering excitedly about Sufjan Stevens’ Illinois; a career-defining album caught by a zeitgeist. Segueing in and out of characters, places and landmarks throughout its considerable running time, Illinois is an expansive album that demands a free afternoon or a long journey, to sit and be appreciated in full. Track-by-track however, Stevens is also generous with the hooks and choruses, with earworming chord progressions and lovely, lapping melodies that drench the album. Several tracks could be pinpointed as centrepieces; Chicago, Casimir Pulaski Day and Jacksonville all fit the bill in terms of scope and composition, acting as very diverse highlights. Chicago towers above other tracks, an epic, voluminous spike on a line graph in terms of joyousness and indelibility, the motif melody painted over in guitar, piano, voice, brass, everything. Casimir Pulaski Day meanwhile somehow manages to sound at once uncomfortably specific and personal, but also expansive and macrospective. Jacksonville utilises almost random-seeming notes in a scale through its sawed violin intro, before piano, banjos and wandering, tremulous guitar lines enter. The layers mount and pattering drums before brass pogos the track into a pleasingly ornate chorus, all connoting travel and movement, parallax layers acting scenery passing the roadside. Elsewhere, despite all of its grandeur and splendour, moments like the breathtaking, eerie John Wayne Gacy, Jr. provide goosebumps and are equally strong. Delving into the psyche of the notorious clown-faced serial killer – and chillingly finding a counterpart in all of us – John Wayne Gacy, Jr. signposts a darker, more overbearingly intimate mood explored further by Stevens in 2015’s exceptional Carrie & Lowell, further signposting how vast and vaulted Illinois was by comparison. It’s an album of scorching, state-sized beauty. Concerning The UFO Sighting is an arresting introduction, a gasping piano chord progression sprinkled with flutes and verbose, poetic lyrics. “When the revenant came down, we couldn’t imagine what it was” Stevens opens up, progressing the narrative quickly from Illinois forests to the barren holy land. The Tallest Man, The Broadest Shoulders is beautifully chamberish, all pattered drums, piano riffs rollicking and orchestration intertwining, unfolding through oddball time signatures. The drum playing smartens up many of the tracks, a house of cards that may have come tumbling down here and on the funky bass-riffed, jazz clubbish They Are Night Zombies!! They Are Neighbors!!. The album could be described as twee, but it’s never overbearingly so, as on Decatur, a ukulele lurch with a creative, mature nursery rhyme scheme, every line progressing more and more impressively written as the song unfolds. Also muscular in places, the instrumentation looms above Stevens’ trademark barely-whispered vocal at times, like on the bristling, anthemic Chicago, choirs rising and falling along with flutes and woodwind, marching band cymbals crashing like breakers all around. The faceted, nuanced presentation of Christianity encountered here is far more fascinating than the binary good/bad or banally secular pose largely assumed by modern music. Christianity is depicted as far from perfect; Superman appears as a surrogate Christ figure in The Man From Metropolis Steals Our Hearts, and the breathy, breathless opener Concerning The UFO Sighting interchanges angels with UFOs. Stevens’ religion isn’t fixed, but imperfect, most of its characters are ancient, many of its locales and settings now non-existent. It is fluid, subject to existential crises (as namechecked in a segue title) and open to interpretation. The narrator of Casimir Pulaski Day finds little comfort in their faith when faced with the death of somebody close to them, who is subsequently subject to several attempted resurrections. Christianity is presented in almost occultist terms, of impenetrable Old Testament miracles and fanaticism; the song is bare-boned, the characters vulnerable as they “lift [their] hands and pray” over a corpse. Having seen the face of God in a window reflection, the narrator is presented as subject to a possible emotional breakdown rather than an epiphany. By the time The Seer’s Tower’s portentous piano chords and swelling choir begins to round out the album with an apocalyptic, near eschatological vision, which the concluding instrumental track Out of Egypt, Into the Great of Laugh Mankind’s new world vision seeks to remedy, Illinois takes on a worldliness all of its own. In a usually secular genre, Stevens’ openness in his faith is both illustrative of his influence and ultimately refreshing, whether or not the listener reciprocates. Stevens plays the auteur to perfection, both here and throughout his career since, seeking to dismantle the success that came to him following Illinois’ release. His obviously tongue-in-cheek (even at the time) assertion that Illinois and its predecessor Michigan would form part of a suite of forty-eight other albums each on the theme of a separate American state in turn is a further case in point. There is a painstaking, almost authorial level of research into such a lush and vibrant concept album as this, exploring the geography, communities and history of the state of Illinois. Nothing short of a tour de force, Illinois’s spiralling length is only matched by its ubiquity; it speaks volumes simply that nothing much else really has managed to sound like it, even ten years on. Stevens’ influence can be felt in the likes of Andrew Bird and Bon Iver’s post-2005 output, and certainly helped buttress Joanna Newsom and Devendra Banhart’s popularity in eking out their similar – but by no means derivative – sounds. And really it’s exactly that about Illinois which demands repeat listens; that it causes all comparisons to collapse. It’s part Danielson – who guests as vocalist on Decatur – part Steve Reich, part Neil Young mysticism, and part Saul Bellow adroitness. There remains little agreement as to who best compares to the sound achieved on Illinois, leading to the conclusion that it may be that very rare occurrence; a totally original album. Make no mistake that Illinois is a tome; at 22 tracks, 74 minutes, 4 sides, even its figures are nothing short of dizzying. Perhaps some of the more indulgent segues could have been pruned slightly. It never feels padded however, and the record presents itself as wonderfully contradictory at every turn. Even its busiest arrangements feel light as a feather, with Stevens’ voice and guitar or piano providing arguably the album’s heaviest moments through their sheer emotion. Its melodies may seem naive at first, but are deceptively multi-faceted. Carrie & Lowell reminded us how strong a concise, condensed, consistent Sufjan record could be. With his diversions on releases such as the folktronica-based The Age of Adz and the orchestral The BQE, he had become more known for his idiosyncrasies than his tunes following Illinois. It took him five years and a dramatic shift in both direction and approach to properly follow up. Some artists, like Stevens or The National managed to worm their way out of the blogosphere era in the years that followed. Some continue to be closely linked with that time period without quite overcoming that association – arguably Battles, Clap Your Hands Say Yeah and Deerhunter for example – others were defined by the era and trapped in there. Fondly remembered, with some great music between them, but never quite surmounting their ‘blog band’ label. It’s been a long road leading Stevens away from such a label, but an Illinois reissue suggests he is now well clear.